ONE of the world’s leading space technology firms has thrown its weight behind a Bid to bring a billion pounds of investment into North Wales. Qioptiq, which employs more than 500 staff in Denbighshire, is firmly behind proposals to improve transport links, digital connectivity, land and propertry infrastructure and support for innovative businesses, which all form part of the North Wales Growth Bid. Cllr Dyfrig Siencyn, leader of Gwynedd County Council and Vice-Chairman of the North Wales Economic Ambition Board, paid a visit to the company’s space manufacturing site in Bodelwyddan and was fascinated by the processes and strides made by the firm in producing glass which features on every satellite launched in the Western world. It came after Qioptiq unveiled a new £3.7 million warehouse at St Asaph to support its £83million contract with the Ministry of Defence, to maintain handheld equipment – including night-vision goggles and weapon sights – for the UK’s Armed Forces over the next six years. 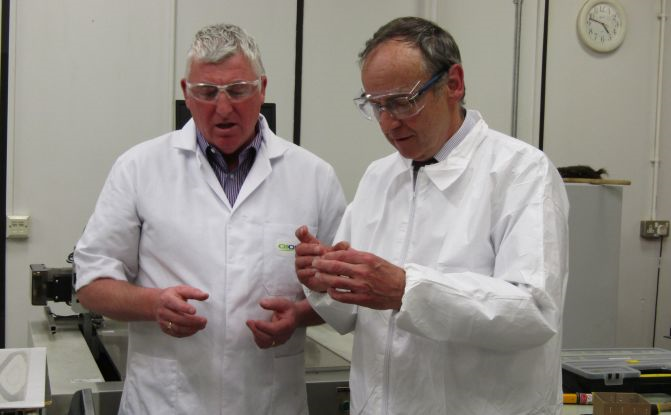 Cllr Siencyn said: “It was a privilege to have the opportunity to tour the facility and witness firsthand the revolutionary work that takes place right here in North Wales. “I’m delighted we have such an innovative and well-respected giant of industry in our corner, as part of the Bid – and wider Growth Vision for the region – is about support of businesses and making it easier for them to produce innovative products and trade both at home and on the world stage. “Improving transport, access routes, digital connectivity and other elements of the Bid will help companies of all sizes – and residents of the six counties – in their day to day lives. Qioptiq – which was acquired by US giant Excelitas Technologies Corp in 2013 – has bases across the world, including Asia and North America. The group designs and manufactures photonic products and solutions that serve a wide range of markets and applications in the areas of medicine, life science, industrial manufacturing, defense and aerospace, and research and development. Craig Taylor, Head of Marketing Communications at Qioptiq, said while the majority of their client base is international, progress in developing the North Wales region for research and industry is vital. “The Bid is something we of course welcome, because it targets significant advances in areas that will benefit both businesses and residents in Denbighshire and the wider area,” said Mr Taylor. “We at the very heart of the technology sector in North Wales so any improvements are to be welcomed, particularly the overall Vision for Growth, which will impact on tens of thousands of people. Driven by the North Wales Economic Ambition Board, which consists of all six councils, FE, HE, and the private sector in partnership with the Welsh Local Government Association (WLGA), The Wales Office and UK and Welsh Governments, the Bid consists of an initial 26 projects centred around digital connectivity, transport, renewable energy, land and property development, business growth and employment, the Welsh language, skills and innovation. However, not all of the projects will go forward and become part of the Deal. Those that do not will be funded via alternative routes. To Back the Bid, follow the hashtag #backthebid or #cefnogircais in Welsh.